Why do I get a warning when uploading my image for print? Warnings about file type, image quality or positioning? Find the answer here. We want to make sure the quality of your print is as high as possible, and one of the ways we do this is by letting you know if something isn't quite right with your artwork before it goes to print. There are three warnings you might see during the product creation process and they relate to your artwork quality, your artwork positioning, and whether or not your artwork contains any transparent pixels. This is likely the first warning you'll come across. As soon as you upload a print file you'll be notified of the print quality of your file. In this case it's not a warning because 300ppi is what we want (it's what we recommend!). So, why are you being told your print quality is poor or bad? 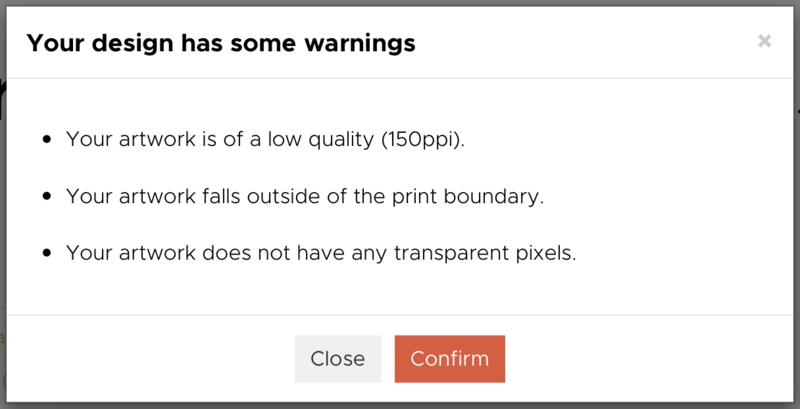 If your print file is lower than 300ppi the product creator tool will let you know through a warning that it's either average or poor. It's a little more complicated than that, though. Your artwork my be 300ppi, but if you've enlarged your artwork the quality will fall. PPI stands for Pixels Per Inch; there are a limited number of pixels in your artwork, and as you enlarge it you stretch these pixels over a larger area. This lowers the quality and the PPI drops as a result. This design started at 300ppi and as it was made larger and larger the quality dropped. The design may look perfectly fine on screen at this size, but the quality will be noticeable when printed. How noticeable the quality is when printed depends on the design and the PPI. 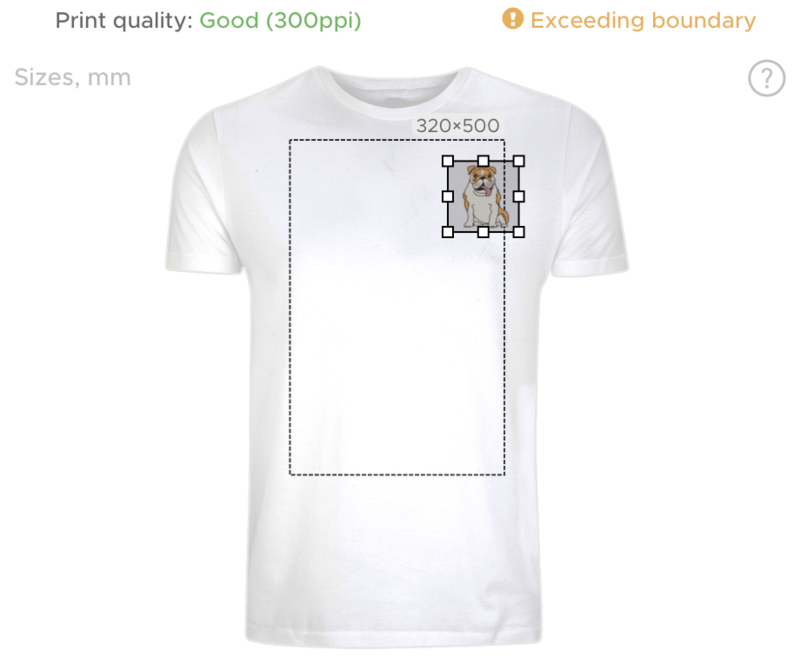 In some cases you might be able to get away with a design of an average print quality, but for complete customer satisfaction we'd recommend sticking with 300ppi. How can I increase my image quality? Once a file is saved you can't increase its quality. To get a 300ppi file to use for print you'll need to return to the original artwork and save a new copy. We also recommend using our templates to create print files using your artwork so that you don't need to resize or reposition your files when uploading them. You can find these templates beneath the product mockup on each product page. If you see this warning it means your artwork falls outside of the printable area for the product you're creating. So, what will happen if your design falls outside this boundary? This depends on your artwork. In simple terms, anything outside of this boundary will be cropped and not printed. In the image above, the area that falls outside of the printable area is filled with the blank pixels of the design's transparent background. These pixels wouldn't be printed anyway, and as long as you're happy with the artwork placement there's no reason why you can't ignore this warning. But it shouldn't always be ignored. In this case the image has been moved slightly outside the print boundary. It's something that can be easy to miss, but this is why the 'Exceeding boundary' warning exists. It's a cue to check your artwork to make sure you're happy with the positioning. Remember: anything outside this boundary will be cropped and not printed. If this image is left as it is the bulldog's haunch will be affected. How can I resolve the 'Exceeding boundary' warning? It's as simple as making sure you're happy with the placement of your artwork. If you want to remove the warning from your product you can simply move the print file so it's completely within the print boundary. 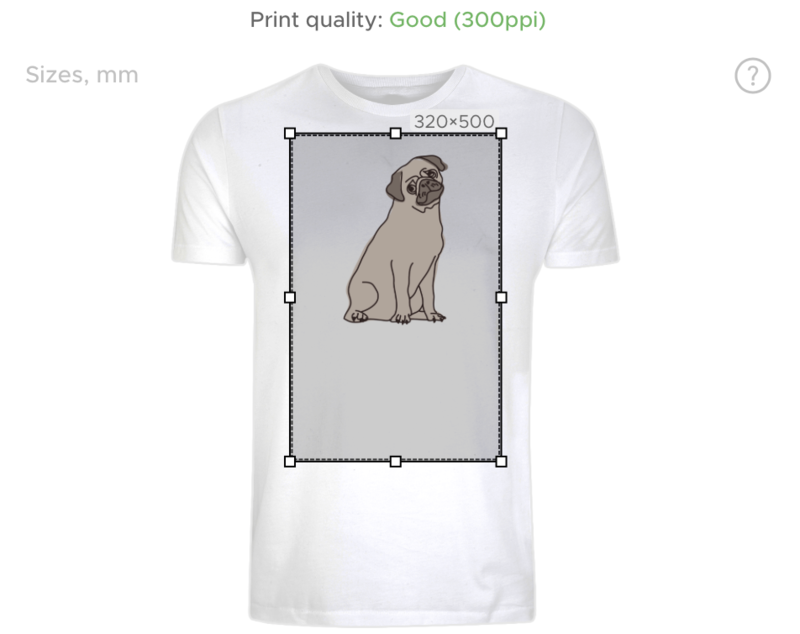 If doing this doesn't allow you to place your artwork as you'd like it printing then you'll need to recreate your print file. You can do this using the templates mentioned above, found beneath each product mockup on its product page. The final warning you'll see relating to your artwork will become apparent when you click the 'Create Product' button. The first two warnings relate to the issues above: the 'print quality' and 'exceeding boundary' warnings. The third warning is simply telling you that your background is not transparent. If you're uploading an image with a white background to a white product, for example, you may not realise that the background is not transparent. We advise that all artwork be uploaded with a transparent background to make sure there are no surprises when the printed product arrives. If you see this warning and assumed your background was transparent then you'll need to click the 'Close' button and upload a different file. Clicking the 'Confirm' button here means you've decided to proceed with the product despite these warnings. It means you've consented to us printing your artwork at the quality stated, to any cropping that may occur, and to print despite the image having a background.